NickLannon.com: Geno Auriemma and the Tyranny of…Wait, Didn’t We Just Do This? Geno Auriemma is the high priest of women’s college basketball. His career record is 1027-136, which, I promise you, is not a typo. I checked it a bunch of times. His University of Connecticut basketball team is the unquestioned top dog (it’s a pun…they’re the Huskies) in the sport. They get all best recruits, lose an average of about one game a season, and nearly always win the National Championship. But Auriemma’s not satisfied. He has no peace. Sports seems to provide the perfect crucible for this sort of impossible-to-satisfy quest. Tom Brady’s on it, and so is almost every other athlete, from the superstars that you watch on television to the kids in your son’s YMCA league. Bode Miller was, and then found release, and wasn’t. There’s always another shot to be made, another goal to be scored, another level to reach. LeBron James has talked about “chasing the ghost” of Michael Jordan. It’s an apt metaphor: unless your name is Ray Stantz, Peter Venkman, Winston Zeddmore, or Egon Spengler, you’re not catching a ghost. In the world of sport and competition, the tyranny of perfection will raise its ugly head again and again. Geno, it seems, needs Jesus. We are all, every one of us, acquainted with perfection, even if we never get nearly as close to it as Auriemma has (and he has several literally perfect—undefeated—seasons on his resumé). We know about perfection because, whether we believe in him or not, perfection is out there. A perfect God created this world, making us—down in our bones—attuned to the existence of such a perfection. To combat it, Geno takes pills. I take Jesus. “The need for perfection, in conflict with the human inability to ever actually achieve it, seems like a recipe for a one-way ticket to a loony bin…” but for Jesus. In Matthew 5:48, when Jesus addresses our need to be perfect directly (“You therefore must be perfect, as your father in heaven is perfect”) he does it in the context of having already promised to be perfect for us. As he begins the Sermon on the Mount, in which he’ll announce this perfect standard, he makes sure to remind his listeners that perfection isn’t really part of their job description. It’s part of his. 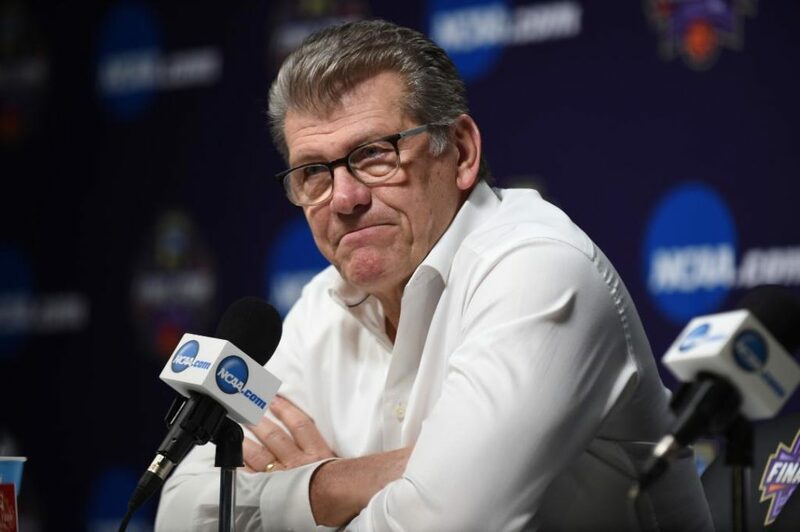 In verse 17, he says, “Do not think that I have come to abolish the Law or the Prophets; I have not come to abolish them but to fulfill them.” Jesus has come to be the perfection that Geno Auriemma so desperately seeks. Jesus has come to be the righteousness that you so desperately need. That unreachable standard is fulfilled in Jesus. We’re all Geno Auriemma. To borrow his phrase, we all got issues. But those of us who know Christ have something bigger than our issues. Jesus said that “in the world you will have tribulation. But take heart; I have overcome the world” (John 16:33). He meant nothing less than that. In Christ, the world—and all of its demands—is overcome. In the middle of Thompson’s piece, Auriemma gives what might be considered a little summary of his life. He says, “Everyone else thinks you have a flawless team, and you're the only one who's miserable.” This is the opposite of Gospel Christianity in every way: a Christian knows for sure that he or she is not flawless, and is in fact nowhere near so. And yet, because of Christ’s misery spilled out for us, we can have that one thing that eludes Auriemma: a peace that passes all understanding (Philippians 4:7). Our misery for Christ’s perfection. Christ’s perfection for our misery. An unreachable standard fulfilled, once and for all. In light of that, you can rest in the peace of Christ’s perfection for you.